Elvis was greeted by reporters today when he showed up for practise. Among other things, he revealed his music selections for both competitive programs - a drum and pan flute piece for the short program, and music from The Count Of Monte Cristo soundtrack for the long program. For a short time, you can watch the full 11-minute uninterupted press conference here, or read a transcription I did here. Elvis talked this morning about his motivation to return to the amateur ranks, and also revealed that his new coach with be Richmond Hill's Linda Bridge, who coaches current Canadian Junior Champion Kenny Rose. April 29 - Elvis announces his return to Olympic eligible skating! The tour kicked off last weekend, and the reviews are already coming in. Elvis is skating to a new program, "In The Middle", by Jimmy Eat World, complete with lots of hydroblading moves. A great page to bookmark for reviews, photos, and articles on the tour is The Skate Blade, which is updated daily. Already there is a page by Rachel with photos of our guy! The tour ended on Jan. 25th in Houston, Texas, and will be on hiatus until April 4th, when the summer tour kicks off in Baltimore, Maryland. Elvis is back on the road, skating in the Winter edition of the popular Champions On Ice tour, following a brief few weeks R&R after completing the SK8 tour. He is skating to one new number, "With Arms Wide Open" by Creed, as well as the tried and true "That Girl" from the summer tour. He skates at almost top billing, second to last. The Elvis tour played to a sold out crowd in London on Saturday Nov. 16th. The cast included up and comer Jeffrey Buttle, Surya Bonaly, Brian Orser, Josee Chouinard, Elizabeth Manley, Rudy Galindo, Dan Hollander, Punsalan & Swallow, Brasseur & Eisler, and of course, our very own Elvis! The show rocks....if you haven't had the chance to take it in as yet, don't pass up the opportunity! Pictures are being updated....they can be found here. November 8 - Dine with Elvis on Nov. 10th; Online chat was fantastic! Dine with Elvis at Montana's Restaurant in Toronto this Sunday....get an autograph or a picture with Elvis and friends. Yesterday Elvis chatted with fans online....read a transcript of this event here. He revealed that he has no plans to participate in any pro-am competitions this year. November 6 - Elvis Tour off and running; Live chat with Elvis tomorrow! The SK8 Tour kicked off in St. John's on Sunday to great reviews....click here to read one, courtesy of the Elvis Discussion Board. There is a live chat scheduled to take place tomorrow, Nov. 7th, at 1 p.m. ET. Details are on the SK8 site, or click here to send Elvis a question! Elvis has added two new shows - a 2 pm show on Nov. 16th at the John Labatt Centre in London, ON, and a 3 pm show on Nov. 3rd at Mile One Stadium in St. John's, NFLD. The Nov. 10th show in Montreal, PQ has been cancelled. Elvis will join a host of other celebrities at the Toronto Argonaut's game on October 20th, during the half-time show, to honour Muhammad Ali. Says Elvis - "Muhammad Ali was always one of my inspirations throughout my career. What he continues to do for humanity is remarkable. I want him to know personally what he has meant to me in my life." In a press release today, it was announced that Canon Canada Inc. has signed-on as the title sponsor for SK8 with Elvis Stojko and Special Guests. 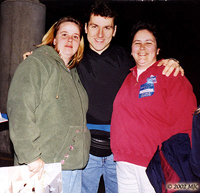 The tour will be re-named Canon SK8 with Elvis Stojko and Special Guests. In addition, the Mississauga-based technology company will be prominently featured in all print materials, signage and tour merchandise. This is the fourth time that Canon has sponsored one of Stojko's skating tours. In a ceremony in Richmond Hill, Elvis was presented with a key to the city by the mayor. Tickets went on sale Monday for all stops the the SK8 tour, and appear to be selling like hotcakes. Many radio stations are doing promotions, giving away free tickets and backstage passes. Tickets are still available for all shows through Ticketmaster. During a press conference today in Richmond Hill, Elvis talked about his new tour, and confirmed that Jamie Salé & David Pelletier, Elena Berezhnaya and Anton Sikharulidze, Isabelle Brasseur & Lloyd Eisler would all be touring with him, although not all at the same time. Other performers include Brian Orser, Liz Manley, Josée Chouinard, Philippe Candeloro, Jeff Buttle and Surya Bonaly. Elvis has signed a contract to commentate for both the 2003 Canadian Championships, and the 2003 World Championships. Champions On Ice comes to a close this weekend for another season.....Elvis will most likely take some R&R before gearing up for his fall tour. His first local appearance is slated for next weekend at Mosport in Toronto.